A quick Google search when my 2006 PC didn't auto update to v1809 indicated there are no new CPU requirements above v1803. Please advise if you discover a hardware reason for the update to v1809 failing. I remind you that although v1809 refused to install, insider version did. It seems the rumors might be true... I read in another thread that Microsoft is deliberately dropping support for older hardware in newer Windows 10 builds. I also have an old Acer Extensa running some T???? 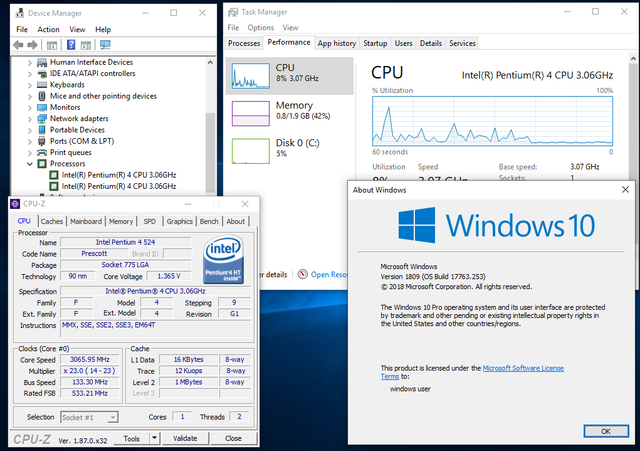 Intel CPU (do not remember which) and I have recently successfully updated to Windows 10 Pro v1809 32-bit. I will tell you once I have access to it again. What if you upgrade to v1809 with one CPU and then replace it with the other? Does it work? PS: That is why is we must always keep an older Windows 10 build available as a fallback when we download a new build. about the question of upgrade to 1809 with one processor then change it later. tried that when I upgraded my Dell e1405 to v1809 using the T7600 (Merom) which upgraded succesfully, then change it to the older T2700 - computer will not boot with the T2700 (Yonah) - froze on the win10 boot splash screen - no animated circling dots at the bottom; both CPUs mentioned are Socket M based processors. not experiencing that problem with v1803. use Speccy or CPU-Z on that old Acer Extensa computer and see which processor it uses. Last edited by erpster4; 04 Mar 2019 at 11:22. That's the exact error message I am getting too on another Core 2 Duo processor (maybe the same). I tried an insider preview version and it worked though. Waiting for 19H1 release although I am not keeping my hopes up. Perhaps they will be supported under 19H1 too. Not "really old hardware", only for info. can you run the CPU-Z tool to see what Core 2 Duo CPU you have, eLPuSHeR? I only encounter that error message with a mobile Intel Core Duo "Yonah" (32bit/x86 only) processor (it was a T2700). If I put in a Core 2 Duo mobile that is based on "Merom" (has Intel EM64T support) [ex. T7600], the error message does not appear when upgrading from 32bit v1803 to 32bit v1809. I am running latest W10 on a T7600 (a MacBookPro2,1 from 2006) and it works fine so I think your analysis is correct. This is it. You are correct, erpster4.